Home > Products > ChargeIt by Jay Gold Plaid Acyrlic Charger Plate 13"
Use the ChargeIt by Jay Gold Plaid Acrylic Charger Plate 13" to add visual flair to your table setting. 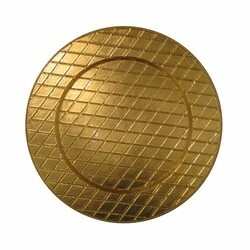 Beautifully designed with an intricate bold grid pattern, this lavish gold charger plate is a stunning piece, perfect for elegant food presentation. A must-have at wedding receptions and other formal occasions, this charger plate is made from high quality acrylic that boasts unparalleled durability and longevity. A stylish and functional piece, this charger plate complements any table decor and protects against spills and mess that can stain your tablecloth.